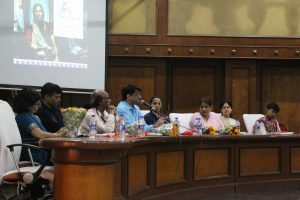 Our Empowerment, Health and Sexuality of Adolescents (EHSAS) Team held a dissemination at the culmination of its project ‘Empowering Adolescent Girls from Vulnerable Communities in Thane City’, in partnership with the United Nations Population Fund (UNFPA) on Friday, 27 April at the Thane Municipal Corporation. The project which ran from August 2016 to March 2018 aimed to strengthen capacities of Government and civil society to empower adolescents, especially young women and girls, with knowledge, life skills and assets to exercise agency. ‘We used a multi-stakeholder approach to affect project outcomes and create an enabling environment for adolescent girls,’ says Rama Shyam, Program Director, EHSAS. ‘We engaged with the girls themselves, ofcourse, through participatory modules on physical, sexual and reproductive health and link them to appropriate services, we also engaged with families of the girls and the larger community, to help them broaden their horizons so that they can enable the girls to reach their full potential. In addition, we worked with public health systems to strengthen its response towards the needs of adolescent girls,’ Rama added. Working across four Health Posts in Kalwa and Thane, the project has worked with a total of 2304 adolescent girls between 10 and 21 years. The most tangible feature is the ‘Community Resource Centres’ set up across project areas in close proximity to the communities where the program participants live. The resource centres offer a non-judgemental and safe space for adolescents to come and share their questions and concerns. The centres house a resource library with books and other media on sexuality, gender, health and human rights. In addition to its engagement with adolescents, these centres engage with parents as well as community gate-keepers through meetings and counselling sessions. ‘Our program participants are affected by a high degree of poverty, in addition to street harassment and safety issues. Strict social norms made restrictive gender stereotypes abundant,’ says Rama, ‘Our program aimed to make information on a wide variety of things available to them easily so that adolescent girls are empowered enough to make their own life choices,’ she adds. In addition to group education classes, girls were also linked to a range of vocational courses, such as tailoring, tally, jewellery making and bed-side nursing. ’50 girls have gone on to secure jobs or start their own enterprises,’ Rama stated. The biggest outcome of the project is that it has been able to cultivate a cadre of change agents- adolescents who are engaged in solving problems in their communities. ‘I’m aware of my rights and entitlements now thanks to the program,’ said a young change agent. Some of these change agents interface with the police regularly. They are known as Police mitras and have also done safety audits in spots they felt unsafe in and discussed with the police on how to make these spaces safer. ‘It helps us immensely to interact with young change agents to identify safe/unsafe spaces in the community. As part of the Police station, now we are more alert about their concerns and seek their support in identifying cases of abuse/harassment’, said a senior Police personnel from the Kalwa Police Station. Some key learnings emerged over the course of implementing the program and will be used to strengthen the next phase of the program. The lessons will also be incorporated in the other projects in the EHSAS program. A qualitative and quantitative evaluation of the program has been done by International Institute of Population Studies and results will be shared shortly.